Big ideas and gaming outside the box. Last year when we conceptualized the Game Tavern we wanted to build a cozy place to have many tabletop adventures in. Ever since we were kids playing D&D in my old garage we dreamed of having a space dedicated to entertaining and gaming. In February the space was finally completed so we took some pictures and shared them with the world. The feedback and excitement was contagious and many gamers hopefully have been inspired to build something similar. We decided to enter the Game Tavern in the Geekie Awards because we wanted that inspiration to reach an even bigger audience. The Geekie Awards® is an award show by geeks for geeks™, aimed at putting the true geek culture in the spotlight as a collection of valid, respected, award-winning genres for storytelling and creation. We are excited to announce that the judges voted the Game Tavern a 2015 nominee! The Game Tavern is competing with four other amazing entries in the Toys & Craft category. Public voting has now gone live and will be used to determine who wins the coveted “Geekie” trophy (pictured here). We are asking for the gaming communities help in spreading the word and giving us your daily votes! We believe the Game Tavern is representative of the gaming community as a whole. 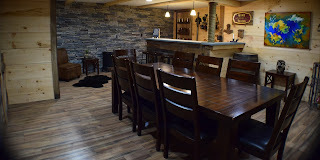 It’s just a cool place to play games and make memories with friends. 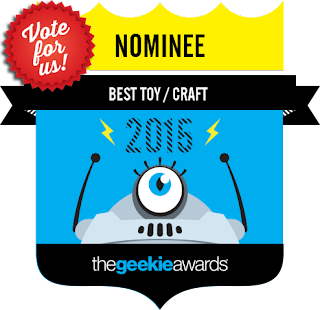 While visiting the Geekie Awards voting site please cast votes in all the categories. My mind is boggled when looking over the incredible work of the contestants. On behalf of the event and all its participants thank you for your support as it’s very much appreciated. Click here to vote daily for the Game Tavern!! Available on the DMs Guild! © Ultanya 2018. Disclaimer: Grand DM cannot be held liable if this blog inspires your DM with ideas. Powered by Blogger.